The Canby Cougars softball team are going to be in a bit of a rebuilding phase this year. Last year, the Cougars graduated a pair of their strongest pitchers, captains Emily Goodman and Morgan Block, and will be seeking to replace them with qualified candidates. The only problem? Canby will be drawing from a talent pool of athletes who have not pitched at the highest level in some time. 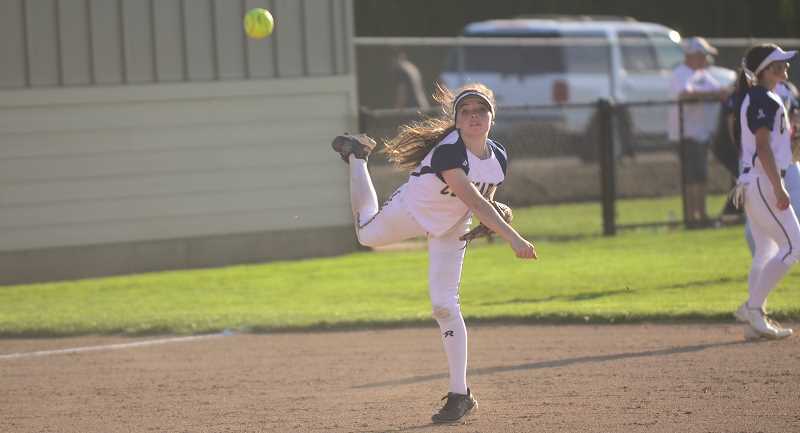 "We've got kids coming up and stepping into the pitcher's mound that haven't pitched for a while, or they were pitching JV last year," Canby head coach Jennifer Peterson said. "Unfortunately we don't have any returning varsity pitchers from last year because they were both seniors. But the ones we have now are working hard and doing the best they can, so that's going to be one of those areas we're working this year." Stepping up to replace Goodman and Block are a host of team oriented players. Sophomore Ruby Kayser, junior Parker Allhands, senior Jessaka Noe, and senior Savannah Tuli will be playing from the mound over the course of the season. "It's finding those kids that used to pitch that can step up and want to work and want to accept the challenge for us," Peterson said. "Those are the kids that have stepped up to accept the challenge and want to help the team out. They're being team players by doing that, which I really appreciate." Another area that the Cougars will need to improve upon in the season if they hope to reach the postseason again is the teams hitting. Last season, Canby scored the second fewest runs in the Three Rivers League (TRL) with 114, only outscoring last place Sherwood. "We have got to hit the ball better than we did last year," Peterson said. "That's one thing we've been working on in the off-season is hitting. A lot of the girls have actually started going back to their hitting coach. We've all realized that since we don't have dominating pitching, we don't have anybody that's throwing 60 plus miles per hour, we've got to be able to hit the ball better. That's one thing we've been working on is our offense." In the tough Three Rivers League, Canby's stiffest competition will be last year's league champions Tualatin, and runner up Tigard. With two starting pitchers gone, the Cougars expect to be battling it out for third place with Lake Oswego and West Linn. The Lakers and the Lions finished ahead of the fifth place Cougars. "Our goal is to be able to hang with those teams," Peterson said. "I think us, Lake Oswego, and West Linn will be towards the middle fighting for those last playoff spots. So, I think we'll be right in the middle. We'll still make playoffs again, but it'll be one of those spots to try to make playoffs because Tigard and Tualatin are so good." To compete against the TRL powerhouses, Peterson is looking to change the dynamic of her teams attack. Namely, diversify the attacking range. "Canby softball has been notorious for being the long ball hitting team," Peterson said. "But this year, we're mixing it up a little bit more and we've got some new girls in that can play small ball. They're really good at bunting and slapping, and then we still have our girls that can hit the long ball. We're going to mix it up a little more this year with not just being a long ball threat, but also being a small ball threat." Canby's first softball game took place on Thursday, Mar. 15 against Beaverton. The Cougars rolled over the visiting Beavers 12-3 to get their season started 1-0.